One waterslide decal sheet for five subjects; full colour instructions. 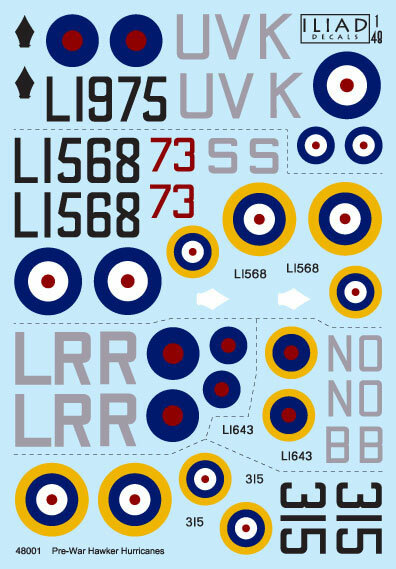 High quality decals; multiple sets of national markings; colour side and upper views with notes included. Five interesting subjects and high quality decals. This one has been out of print for quite some time and makes a welcome return - with an extra scheme to boot! 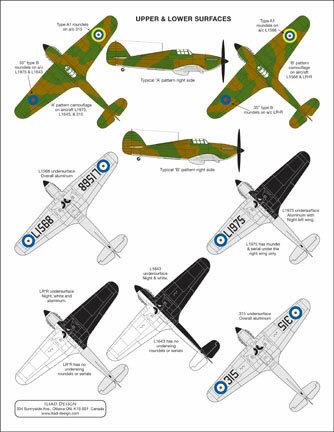 Iliad Design of Canada has re-released one of their most popular decal sheets - Item No. 48001 Pre-War Hurricanes. An extra scheme has been fitted on to this reincarnation. Hurricane Mk.I, 315 1 Sqn RCAF 1939. Instructions are offered over a folded A4 sheet in full colour, with one side plus upper and lower views plus notes on the camouflage and units. Decals are printed perfectly on my sample, and colours look good. 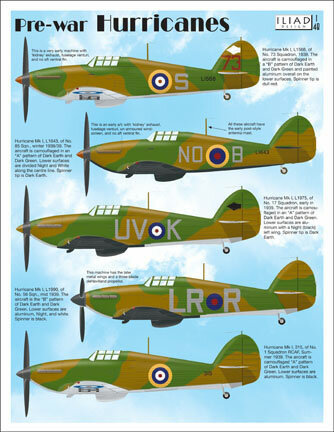 These are five interesting subjects for your 1/48 scale Hurricanes. This one has been out of print for quite some time and makes a welcome return - with an extra scheme to boot! Thanks to Iliad Design for the review sample.